Ball valves are straight-through flow valves which provide positive shutoff with minimal pressure drop and flow turbulence. The barrier to flow is a ball which is rotated 90 degrees to the direction of flow. 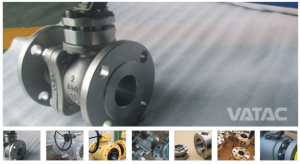 A floating ball valve is a valve with its ball floating (not fixed by a trunnion) inside the valve body, it drifts toward to the downstream side and tightly pushes against the seat under the medium pressure to ensure sealing reliability. The floating ball valve has simple structure, good sealing performance but the seat material is required to withstand the workload since the sealing pressure is beared by the seat ring. Due to unavailability of high performance seat material, floating ball valve is mainly used in middle or low pressure application. Because the stem motion from full open to full closed is a 90 degree rotation, ball valves are ideally suited for automatic operation. They may generally be installed without regard for flow direction. ● RELIABLE SEAT SEALING: The structure design of double-beveled sealing ring has been adopted to reduce the friction between the ball and the sealing ring to achieve lower operation torque. When the medium pressure is low, the ball has smaller contacting surface with sealing ring, which introduces higher sealing pressure to ensure the sealing reliability. When the medium pressure gets higher, the contacting area between ball and sealing ring increases accordingly. Larger contact area reduces the sealing pressure to avoid the deformation of sealing ring. ● BLOW-OUT PROOF STEM: Internally inserted “backseated” stem assures fire safety and blow-out prevention by retaining stem in the valve at all pressure. ● ANTI-STATIC DEVICE: A conductive spring and a graphite washer provide antistatic continuity throughout the valve. 1″ bore-4″ bore, CL 600,900 & 1500 use spring-loaded pins between the ball, stem, and body to provide antistatic continuity throughout the valve. ● FIRE-SAFE DESIGN: In case of fire, non-fireproof material for packing and seat will be burnt-out and considerable medium leakage may possibly cause fire spread. Vatac adopted metal to metal seal as auxiliary structure to prevent medium leakage. Which conforms to the requirements of standards API607, API 6FA or BS 6755.